It’s not often that I stumble upon an illusion I can’t figure out. What you see below isn’t some team building assignment, but rather an optical illusion. I assure you it’s not manipulated. This is really puzzling, don’t you agree? Your previous assignments were much easier you have to admit. Like the time when I couldn’t spot that easy baby illusion. Let’s brain-storm this one. How did it took place? After this you might want to solve some easier examples, and let your brain relax. The ones I’m referring to are impossible bottles and cube toy. is anything nailed down or is it a matter of angles? Those r tight. so fun to do with paperclips and penils. 1st comment.!! I think I figured it out I see two possible nails one on that part on the hammer that has a name but I can’t remember it at the moment and the other on that string or wire thing. All I can think of is that they somehow managed to hang the hammer perfectly, so it sags in such a way that it pushes one end of the ruler up, pushing the other end down, into the table, and therefore holding itself up… it’d have to be, like, a titanium ruler though. the weight of the hammer is centered below the wooden board. This is similar to those single wine bottle holder (e.g., http://www.wineintro.com/products/racks/balance.html). It’s not an optical illusion. It’s a trick. A hammer, ruler and hair tie will balance just like that without effort. This is simple. It is EXACTLY as it looks. You can try it at home, and I assure you it will work. The center of gravity is BEHIND the end of the ruler. There is absolutely NO trick – everything is just like you see it. I think we are looking down at the hammer and the ruler…and the board of wood is standing on its side and proped up by something out of the frame….. When I were a lad we learned this stuff in primary school! And we didnt need bad language or insults to help others learn! Centre of gravity trick – simple but effective & useful if applied to ‘real’ life! the weight of the hammer pulls the ruler down, but the hammers handle is up and thus pushes the ruler up! I hope i dont make a noob of myself with somebody proving me wrong. but for all i know it could be, i inferred this in a matter of seconds. its REAL. the heavy end of the hammer is keeping the ruler on the wood while pushing up on the other side. theres no trick, i tried it it works. =] I WIN!!! its upside down!.. the hammer is anchored by a nail thus it holds the ruler NOT the opposite. It’s clearly just a matter of balance/center of mass. I swear to God, next you’re going to be posting a movie of somebody doing the moonwalk and saying it’s an optical illusion. HOW DOES HE DO IT? IS IT ROPES AND PULLEYS? I just tried this and it works. No Illusion here, just physics. The head of the hammer has the most mass, the ruler and handle have a larger “moment about the axis” or more leverage. So they balance. It’s the same type of effect as the spoon/fork and match stick on the side of the glass trick. Its all to do with weight and counter balance. No nails, no glue. the head of a hammer is heavy, pushing the centre of gravity to the left of the edge of the table. It’s no illusion, it’s just physics. Re: Anonymous no. 1: Does being offensive make you feel better? If you can’t say something politely, don’t bother saying it at all. Also, please learn to spell properly. well i think the ruler is glued to the table with super glue and the other side of the ruler is being held up with invisible string so it makes the hammer stay on. Its something to do with gravity isnt it!?!?! This is awesome. I teach science and we do this experiment. Also works with tooth pick and small spoon. It all about balance and centre of gravity. I loved it! Thanks. This is a trick based all on balance. I did this at home and it worked. String hammer and a rulerput it together as it is shown it may take a little adjusting string length, but it does work.no nails or photo tricks required. 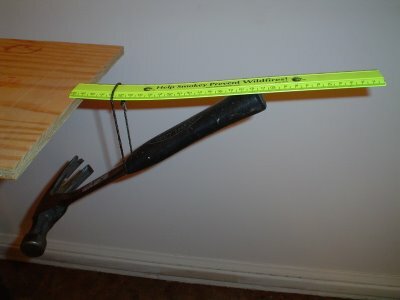 The wieght of the head of the hammer works with the perfectly possitioned piece of string to create a seesaw effect that is sufficient enough to hold the ruler and the weight of the hammer, hence the ruler is bending up. hah, the comments are hilarious. I mean, it’s obvious that an invisible alien from planet zeta is standing right below the ruler and is holding it up! I can even almost kinda see it! Come on, people! This is a classic case of physics. The head of the hammer has more mass than the handle of the hammer and the ruler have combined. The center of mass of the entire contraption is to the left of the edge of the table, meaning on the table. Therefore it cannot fall. This is mearly physics and balacing forces. Why get yourself is a state over this. its so simple, all it is is the hammer head pushing weight down while the bottom of the handle is putting force on the ruler at the same time. I TOTALLY AGREE WITH “ONEFRECLEDFROG”!!!! The weight of the head of the hammer balances it out. I dont think there are any nails involved. Its to do with the center of gravity. Now the ruler is balance at the end of the wood. The strig causes the end of the hammer to be pushed against the ruler. This makes the ruler and hammer act as one object. If you notice the heavy part of the hammer is left of the end of the ruler. This moves the center of gravity to below tip of the ruler and thus stopping it from falling over. Sorry if I’ve explained this badly but im not a scientist. Basic cantelever physics I think you will find. Used a lot by Frank Lloyd Wright – but good for the brain! looks like the handle part of the hammer is nailed to the wall. Omg that’s awesome. I wonder how people do that stuff. ya,not an illusion just a simple method of balancing it. and you could make a ruler float in mid air? it’s either the center balance point, or it’s actually on a flat surface that looks like a wall (I didn’t realise it was a wall at first, i thought it was a flat bench and was confused as to how it was an illusion! ok yall. look at the angle of the ruler and the shadow. it appears to me that there is a nail in the wall where the ruler angles to touch it at the far end. i don’t think the side of the rulerais actually parallel to the board. it is simply – as said – multiple times before – it is simply an issue of the centre of gravity being just under where the ruler meets the table. The string holding the hammer to the ruler – as said before – creates a lever and fulcrum effect (fulcrum being where the hammer meets the string) and the lever moves over (because the head of the hammer has a greater mass than the handle) exerting a force onto the ruler causing it to bend upwards and still – as stated before – makes the hammer and ruler act as a single entity with a centre of gravity below the far left of the ruler in this case. Ultimately this means that the hammer-ruler entity can balance on the tip of the ruler directly above the centre of gravity. The hammer-ruler and other experiments like the fork-cork can easily be replicated. As a simpler analogy – imagine a G-Clamp (large g-shaped clamp used all over the place mainly in wood/metal work but also has countless other applications – also called a C-Clamp). You can sit the G-Clamp on a desk (with the screw hanging downwards towards the floor – and not tightened so as to clamp the desk obviously) and it will balance. You can hang whatever weights you want from the screw and it will still balance. You can also purchase penholders that are shaped like an upturned ‘7’ balancing on the point of the shorter stroke. Some perpetual motion machines (fascinating small desk ornaments that don’t actually exhibit perpetual motion but they still run for hours without any formal (apart from the initial) energy input. There are many other examples too! I think that’s a simple enough explanation. Have fun! the string stops the hammer from falling. the handle of the hammer is pushing up at the end of the ruler. the weight of the metal part of the hammer keeps it balanced. there is a part of the ruler on the table, this is for show that a ruler can stay in midair – which is not true. you can see how the ruler bends after the string because of the pressure. i have done this before and is really hard. it requires much balance and a strong ruler. all i can say is that there is no nailing or hammering required. Look at it upside down, the hammer is touching the floor, and it’s almost looking like the ruler is glued to the table. Hahahahahaha!!! Why do we even bother? If you look carefully there is anail in the claw of the hammer and i suspect that there is a nail in the wall under the ruler. Study the shadow, the ruler is closer to the wall than it seems and has been positioned at an angle so that the edge of the shelf alters the perspective of the picture (the angle of the string which slants away from you confirms this). for the ruler to tip downwards, the hammer would have to move upwards raising the center of gravity of the system. So the system is therefore stable. It is not a matter of center of balance. If done right you can probably do it without having the hammer head underneath the table. Because of the string, the entire mass of the hammer can be treated as a point mass at the point where the string is attached on the ruler. providing a negative torque. (clockwise from the observer’s point of view) equal to the mass of the hammer times the distance from the table edge. However we also see another another source of torque from the handle in the positive (counter-clockwise) direction. Now, the magnitude of the force is less than the magnitude of the force from the entire hammer, but because it is applied at a more distant point from the fulcrum the torque is greater thereby allowing the equilibrium seen in the photo. Are all you people NUTS? Look at the shadows! All the things on the picture are on the floor! I’m 9 years old and I worked that out! Nice balance! I also like the vid poster number 20 provided a link for. The hammer is keeping the ruler to the table. We had to do this in school but we had to do it with a METER STICK! maybe it’s about the center of gravity..
Wow! That’s weird. I think they put the hammer on the wall somehow. Hehehee! nice to read here the ludicrous comments from glue- and nailmaniacs. Be reasonable. That trick is real! I have done the same trick. And some wont believe it even if their see it with their own eyes from any angle. If you flip the picture upside down, it looks like the hammer is glued to the wall and is holding the ruler up. Whether that is not it, that makes a good optical illusion within itself. I also think it is real. I have dome some basic calculations based on what I see in the picture. First, here are what I estimated – The hammer is hanging approx 3.5 units from the table and the hammer is touching 17.5 units from the table. Based on this I calculate (based on turning moments – Physics) that ratio of 1.the difference between the heavy side of the hammer and its light side to 2. the sum of the heavy side of the hammer and its light side is 5 (17.5 / 3.5) – Thus I calculate based on this that the light side of the hammer is 2/3 of the heavy side. Now that seems reasonable to me as that is what I expect in a real hammer. Now I realize that this is not a direct verification. All I have done is to take what I can at face value and calculated a number for a piece of equipment I know and that seems to be able to provide the required forces for balance. OMG you are all dumb, can’t you see there’s a refrigerator hanging off one side of the picture with a chain tied to a truck, which is counterbalancing the color yellow, which influences the weight of the basket of sunflowers which is sitting on the edge of the piece of glass with the fishing wire attached to the hammer, causing the earth’s gravitational forces to pull the moon closer, influencing the tides, making one side of the equator heavier than the other, which makes this picture possible in Guam. And that’s where it was taken. Solved. Me FTW. I will now ignore all accusations of idiocy or statements to the contrary of my answer. oh…. wow the magical tricks of a shelf and stuff holding other stuff up and a nail in the wall?!? its impossible to balance it like this without the hammer being on a floor! the ruler is leaning on the hammer, while the hammer is hanging under the ruler! I’s suspicious of how the hammer IS (?) angling in towards the wall, isn’t it? There is no illusion here, only delusional people. It’s just physics. Its magic. Thats all there is to it. Whoever did this knows how to bend the universe to their will. A person should not have such power. We need to find out whoever is doing this and remove them from this world before it is too late. I love how people concoct theories without proper testing. I just tested this… It works. It’s a matter of balance. Since the head of the hammer is actually under the table it moves the center of gravity of the ruler back to the edge of the table. Science is awesome. It’s the center of gravity, you stupid cunts. It’s easy, well sort of >_< you hang the hammer on the ruler and then let the end of the hammer press against the ruler *that's why it's bending* and balance it on the table, with is the hard part, because it's like half an inch of ruler. Tadah! Its not intuitive which is what makes this “illusion” so fascinating. At first look, you think “there is no opposing force” Gravity must be acting on the ruler AND the hammer, so this is impossible. The key is in the position of the head of the hammer. Forget the long end of the ruler. That is where we immediately focus. Forget it. Just look at the hammer head UNDER the table. You need equal and opposite forces to keep this balanced. Those forces occur on the lip of the table. The force of the hammer is far enough under the table that the opposing forces balance right on the edge of the counter top. This particular image is also deceptive because the camera angle makes the hammer head look to far over to balance. Don’t focus on the ruler, focus on the counter top and go from there. Physics. Or….its simply something that is possible. The hammers back end is exerting an upward force more powerful than the pull of gravity. You can see this from the ruler bending upwards near the bottom. Its like having someone hold the other end in essence and then tie the hammer in the middle. Its just another support for it! Physics dumbass, physics, didn’t you read about this stuff in middle school? It is a simple balance trick. I have done it with all kinds of tools. The weight of the hammer head is under the board. Perhaps all of the items are actually on the floor laying down just made to look like they6 are balancing. No optical illusion here. Just plain physics. Gravity doing what it does best. Another neat one is a small jack-knife and a pencil. Open the knife to 90 degrees. Stick the point into the pencil at about a 45 degree angle about 1/3 of the way between the point and the eraser. The whole thing will now balance on the point of the pencil. On the end of your finger or a table top, or whatever. With a little imagination you can come up with all kinds of combinations. what Bradley said before is right, about the back end of the hammer creating an upwards force stronger than gravity. the ruler is only bending because it is cheap plastic for all those who commented on it. if you want it not to bend then just get a stronger ruler. didn’t think i should have to explain that. tilt ur head to the left. its rather simple. the ruler is glued to the table. and the hammer is being supported at the bottom. and is leaning out but the string is stopping it from falling. LOL, the level of stupidity in some of these comments is hilarious. Its real, its all about the center of gravity. Still don’t understand? Go read or book or pay more attention in school next time. Better yet, just try it. YES, the picture is taken at a weird angle, and its on purpose. If the picture was taken directly from the side, you would see that the head of the hammer is under the table. Come on people, just try it. The hammer is actually stabilizing the ruler. The string is acting as a balance. Therefore, the weight of the head of the hammer is pushing up on the handle and the ruler. So that, even though the weight of the ruler and head of the hammer are pulling down, the entire weight of the hammer is pushing UP. So there is more force pushing up than is pushing down. I’m a physics teacher, and use this a lot when I’m teaching about moments. The head of the hammer is by far the heaviest part. This makes it the centre of gravity – the weight of the hammer pulls down from the head of the hammer. The head of the hammer is to the left of the string. The string acts as a pivot. Because the force on the hammer is to the left of the pivot, the hammer tries to rotate anticlockwise (counter-clockwise to our American friends) about the string. However, it can’t do this because the end of the hammer pushes against the ruler. This is where it gets interesting. The end of the hammer is now exerting a force on the far end of the ruler. This creates a clockwise moment. However, this is balanced by the anticlockwise moment of the weight of the ruller pulling on the string. Therefore, the hammer stays where it is – the ruler can’t rotate anticlockwise off the table, because the clockwise moment of the head prevents this. It can’t rotate up further, because the weight balances it out. Alternatively, you can resolve the forces to show that the centre of mass of the system is past the edge of the table, which whill prevent it falling off. I suggest you try it if you want. Not sure this should be categorised as an illusion as it is simply raw naked physics, no manipulation here to deceive, nice job. This shows the level of stupidity of some people. Most people have or can get a hold of a hammer, a ruler, a rubber band and a table. Just get those things and DO it. Simples. Basically a balancing of opposing forces. it’s because center of gravity , similar to balancing a broken ring or hoopla on the end of your finger .